The newest pattern from Chalk & Notch released today and I'm sharing my super comfy, maternity friendly Pixie Tee I sewed up for the pattern test. If you didn't know already, I'm a bit of a Chalk & Notch fangirl. From printing to the last stitch Gabriela's patterns are impeccable, and this new tee is no exception. The Pixie Tee features two views, one with short sleeves and an elasticized hem with side ties, and another with long sleeves and a banded hem and cuffs. Both views can be made in a top or dress length as well. The boxy style looks great in knits with some drape like bamboo jersey or rayon french terry. I used a rayon spandex from Joann with a polyester crepe for my side ties--you could also use ribbon for the ties too! Being seven months pregnant I'm always on the hunt for patterns that are bump friendly or can be with minimal changes, and further, ones that can still be wearable post pregnancy without screaming "maternity". The looser fit of the Pixie lends itself to a maternity tee perfectly! For my tee, I decided to make up my regular size. It was suggested that one go by the smaller measurement of your upper bust and full bust when picking a size and that method served me well. My upper bust puts me at size 16, full bust at size 18, and I'm very happy with the overall fit of the straight 16. While the pattern is designed to hit mid-rise and I'd normally need to shorten the length to achieve that look, I decided to keep the full length to accommodate my belly and then curved the hem of the front piece down 1.5" for a little extra bump coverage. I love the fit over my belly and because I didn't add any ruching or anything, the shirt should transition nicely to a non-maternity closet--at the very worst I would just have to re-hem the front and that's it. I wasn't quite sure how I'd feel about the elastic hem on this tee but now that I've done it I absolutely love it. Its such a cute detail and though I worried how it would feel under my belly, by the end of the day I can honestly say it was beyond comfortable--and this is coming from a gal that normally can't stand any kind of waistband or elastic under my bump. When I sewed mine up it went straight from the machine to my body and has since been worn several times since testing--I don't think its even made it out of the clean laundry to my closet, I'm so eager to put it back on! It really is that good. 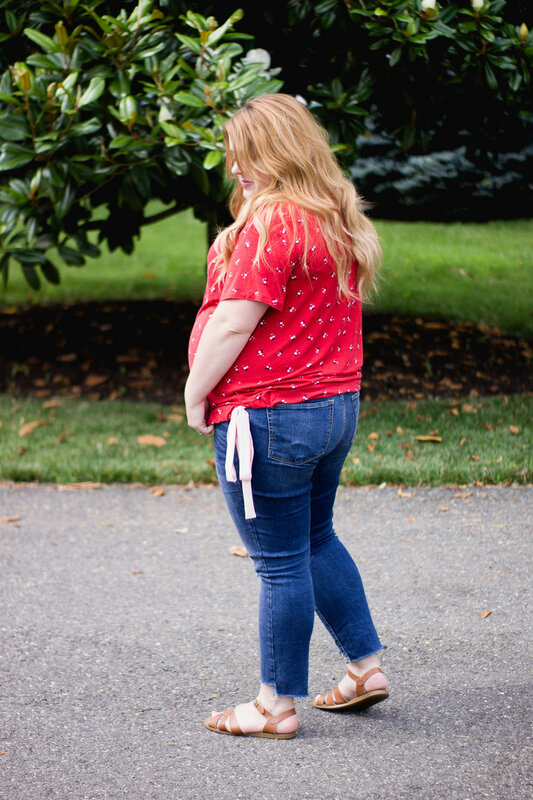 I always envision myself wearing fashionable blouses and tops but usually end up in a t-shirt, so I love that the Pixie wears like a favorite tee but has details like the gathered hem and side ties to elevate my top and make me feel a little more put together as well. The Pixie Tee is on sale through July 2nd so definitely go grab your copy! You'll also get to see the new Chalk & Notch tutorial layout and design which looks so good and is super user friendly. Gabriela does it right, folks. You can also take a gander at the Pixie Tee Release blog post for more tester photos and inspiration. Check it out!